Are you looking to meet other LGB&T people in your area? Need some support around your sexual orientation or gender identity? Or are you keen to take part in activities and events with other like-minded LGB&T people? Lancashire LGBT is proud to support a number of groups and activities across Lancashire that provide a diverse range of opportunities for LGB&T (including non-binary) people. For more details about peer support and social support groups taking place near you, please visit our Events Calendar. Short/medium walks (5-7 miles) on the 3rd Saturday of the month excluding December/January. Check out our Events calendar for details of the next walk, or contact Lancashire LGBT on 01772 717461 or email hello@lancslgbt.org.uk. C/o Brook Advisory Centre, 54-56 Darwen St, Blackburn, BB2 2BL. Age range 15-25. Meets most Tuesdays. For details of meeting days and times, contact Jackie Buckley on 07889 057520 or email jackie.buckley@brook.org.uk. Also see Facebook page. Weekly on Tuesdays, 5pm – 6pm. Age range 12-16 and 16-19. For more information please call 01254 292000. A social group for anyone who identifies as LGB or T, variations thereof, and their supporters. You don’t have to identify as LGB or T to be an Ally. 1st and 3rd Tuesday of the month 6pm-8pm, at Horizon, 102 Dickson Road, Blackpool. For more details or to express interest in attending, contact Anthony on 07875 355390 (awest@druglinelancs.co.uk) or the office number 01253 311431. Meets on the 2nd Tuesday of every month at Horizon, 102 Dickson Rd, Blackpool, from 6:00-8:00pm. For more details or to express interest in attending, contact or Anthony on 07875 355390 (awest@druglinelancs.co.uk) or the office number 01253 311431. A social and support group for Gay and Bisexual Men aged 25+. Meets every other Wednesday at Horizon. For more details or to express interest in attending, contact or Anthony on 07875 355390 (awest@druglinelancs.co.uk) or the office number 01253 311431. Meets every Thursday from 12:30pm – 2.00pm at various locations around Blackpool. For details of the next meeting please contact Horizon on 01253 311431. Red Ribbon Group – a social and support group for those living with and affected by HIV. Meets every other Wednesday at Horizon. For details of the next meeting please contact Horizon on 01253 311431. Parents and Partners – a social and support group for parents, partners and carers of those living with HIV in the local community. For more information please contact the horizon office number 01253 311431.or Anthony on 07875 355390 . For more information about these Horizon groups, or to express an interest in attending, please contact Anthony on 07875 355390 (awest@druglinelancs.co.uk) or the Horizon office number 01253 311431. UR Potential has three groups for LGB&T and non-binary young people in Blackpool, Fylde and Wyre, plus three Family Support group for parents and other family members of LGB&T and non-binary young people. Also a Trans-only young people’s group. Contact the LGBT workers at UR Potential for more details. 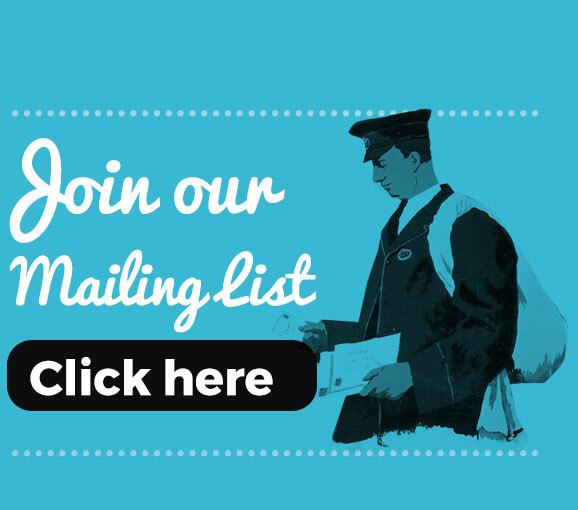 Email lgbt@urpotential.co.uk or telephone 01253 344398. Every first Thursday 6.30 monthly. Call 07875 355390 for details of time and venue. C/o Brook Advisory Centre, 54-56 Darwen St, Blackburn, BB2 2BL. For details of meeting days and times, contact Jackie Buckley on 07889 057520 or email jackie.buckley@brook.org.uk. Arms Out is a support network for parents of children and young people who identify as Transgender (including non-binary). Based in the Chorley area but open to parents from all over Lancashire. Contact Lancashire LGBT to be put in touch with the parents who facilitate the network. Support group meets once a month on a Wednesday evening in Chorley. East Lancashire LGBTQIA Social Group. See Facebook group. Wyre LGB&T Youth Group, Wednesdays from 4.30pm – 6.30pm (11-17 section and 18+ section). meets in Fleetwood. For more details please contact louise@urpotential.co.uk or mobile 07453 959567; or phone the UR Potential office on 01253 344398. Lytham Let Live: the Fylde LGBT Friendship group. Meets at St Annes Pavilion, Ashton Gardens, from 10.00am – 12.00 noon, on the 1st Wednesday of the month. 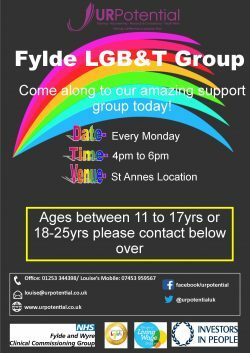 Fylde LGB&T Youth Group, Mondays from 4.00pm – 6.00pm (11-17 section and 18+ section). Meets in St Annes. For more details please contact louise@urpotential.co.uk or mobile 07453 959567; or phone the UR Potential office on 01253 344398. Runs groups in the Lancaster area including Trans Men’s group, Trans Women’s group, Family Support group and an LGBT coffee afternoon in Lancaster,– see our Events Calendar for details, or the Out in the Bay website www.oitb.co.uk or Facebook page For more information, contact infoOITB@gmail.com. LGBTQ Youth Group for young people aged between 13 and 19. For more details, send a text to text on 07717 301821. More info: Rebecca 07779 456476. Meets Thursday fortnightly, with an under-19s group meeting on the alternate Thursdays.. For the current venue, dates and times please join the closed Facebook group at https://www.facebook.com/groups/259805954645497/. Weekly group for LGBTQ people in the Skelmersdale area. Meets Saturdays 1pm-3pm at The P.U.L.S.E., Unit 73 in the Concourse Shopping Centre. Call 01695 556630 for details and to check the meeting time. Also on Facebook under Skelmersdale LGBTQ. Or call/text: 07901 854823 (answerphone).